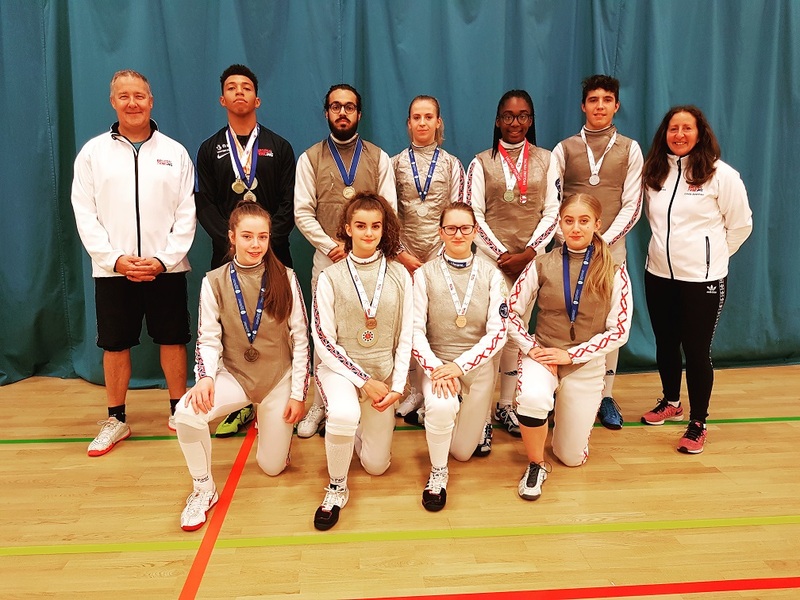 Newham Swords Fencing Club, run by Olympians Pierre Harper and Linda Strachan, has had its best season ever at cadet, junior and senior level. 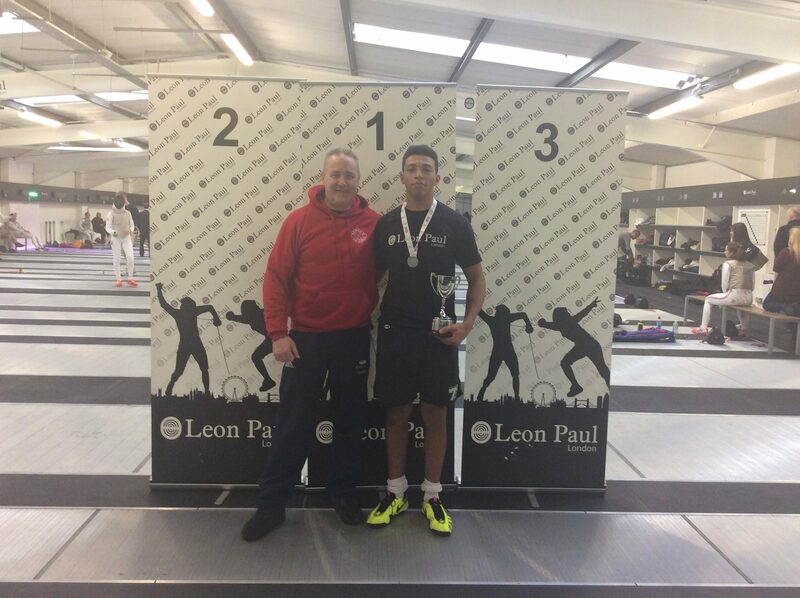 At Senior Level, GB International and Junior Commonwealth Gold Medallist, Kamal Minott, won the London Senior Foil, the Invicta Senior Open, the Birmingham International Tournament and took bronze at the Senior National Championships before being crowned National U23 Champion. 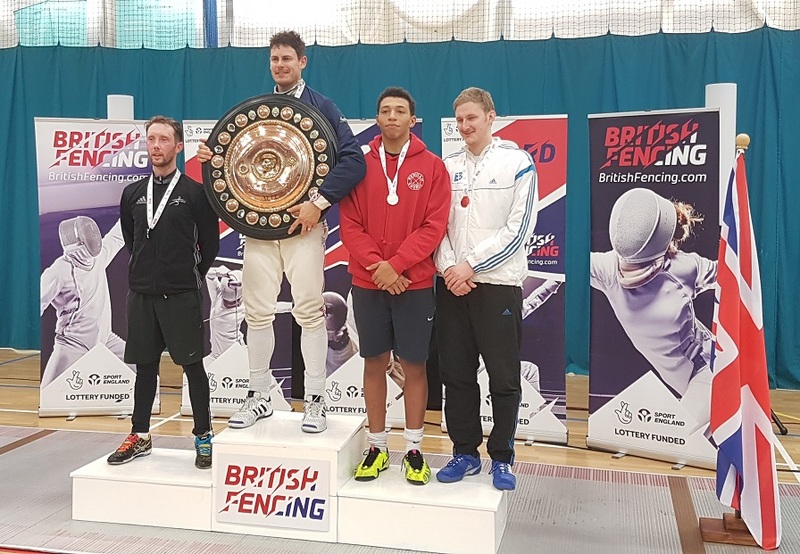 He has now been recently selected to represent England at the Senior Commonwealth Fencing Championships which will take place in Australia in November. “To achieve all of this in one season, at just 20 years of age, is outstanding”, said Head Coach, Pierre Harper. Club mate, and former Junior World Championships Team Bronze Medallist, Rajan Rai, has also been selected for the Senior Commonwealths. At Junior Level, GB International, Alice Campbell, took double gold at the UK School Games before being selected to represent GB at the Junior European Championships and Junior Worlds. She has now been selected to represent England at the Junior Commonwealth Fencing Championships which will take place in Newcastle next month. At Cadet Level, England U17 Number 1 and GB International, Teagan Williams-Stewart, achieved 5th place at the Senior British Championships (missing out on a bronze by just one hit), took a bronze at the Birmingham Senior International Tournament and Essex Senior Open, and won the Invicta Senior Open (at just 15 years of age). “These results obtained at senior level, (for someone aged just 15) are remarkable and show just how talented Teagan is”, said Club Manager, Linda Strachan. Teagan Williams-Stewart (2nd left) Invicta Gold medallist with Newham companions and Bronze medallists Georgia Silk, GB U17 International and Alice Campbell, GB U20 International. 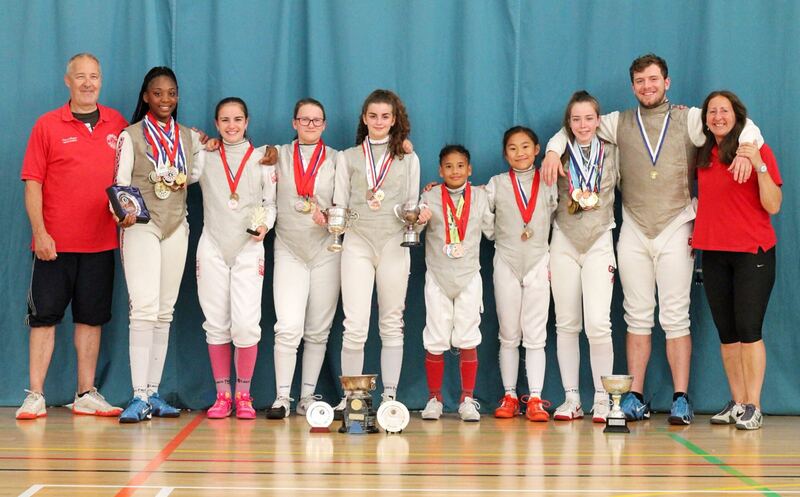 Our next generation of talented young fencers have also made a great impression this season. 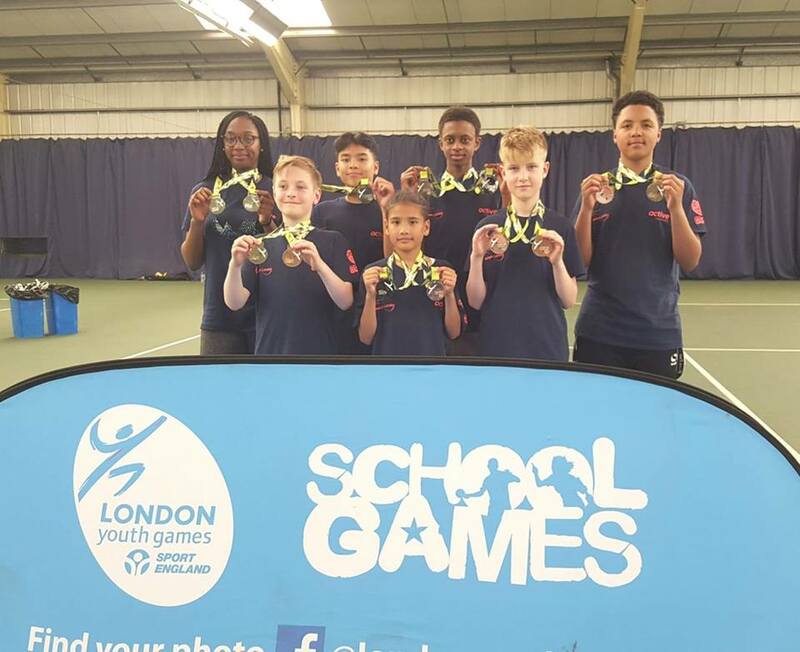 Newham’s Fencing Team (made up of six Newham Swords fencers) took overall silver at this year’s London Youth Games, having already won the overall title a record seven times (which has never been equalled by any other Borough). 11 year old rising star, Khalam Contractor, (last year’s British U10 Silver Medallist), achieved a personal best this season when taking bronze in the U11 Age Group, at last month’s English Youth Championships. 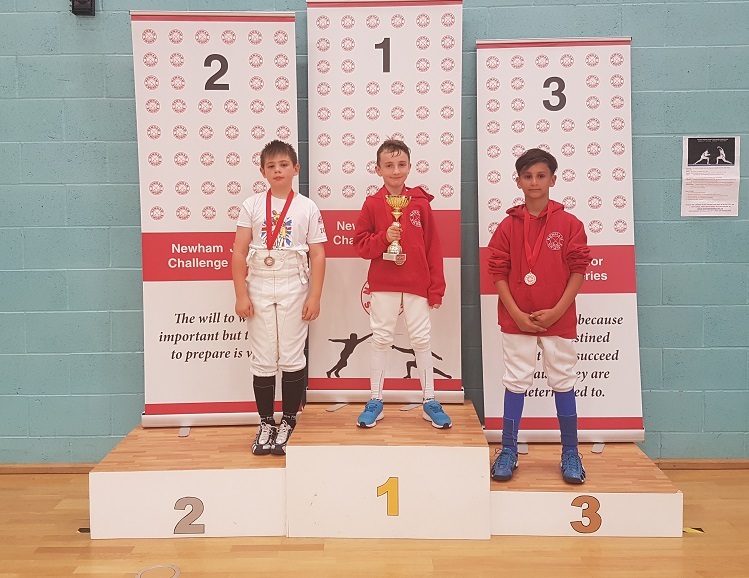 8 year old Mohammed Belbouab took gold at the London Leon Paul National Junior Tournament earlier in the season, as well as gold at the last Newham National Junior Series Event. 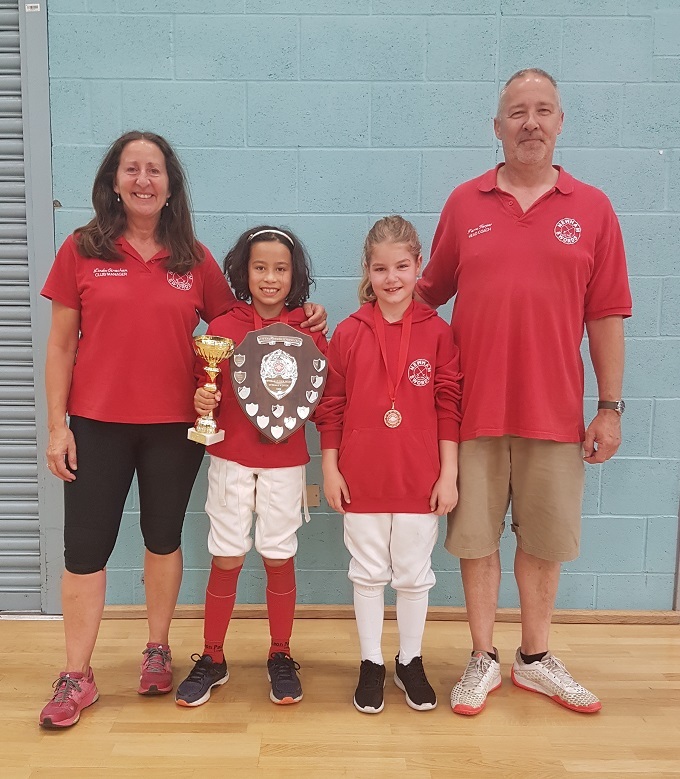 Further U9 results have come from Isabella Manglangit who took gold in the 3rd and 4th Newham National Junior Series Events (making her the Overall Series Winner), and from team-mate, Delia Cheta, who has already taken two bronzes this season despite only having been fencing for just two months. 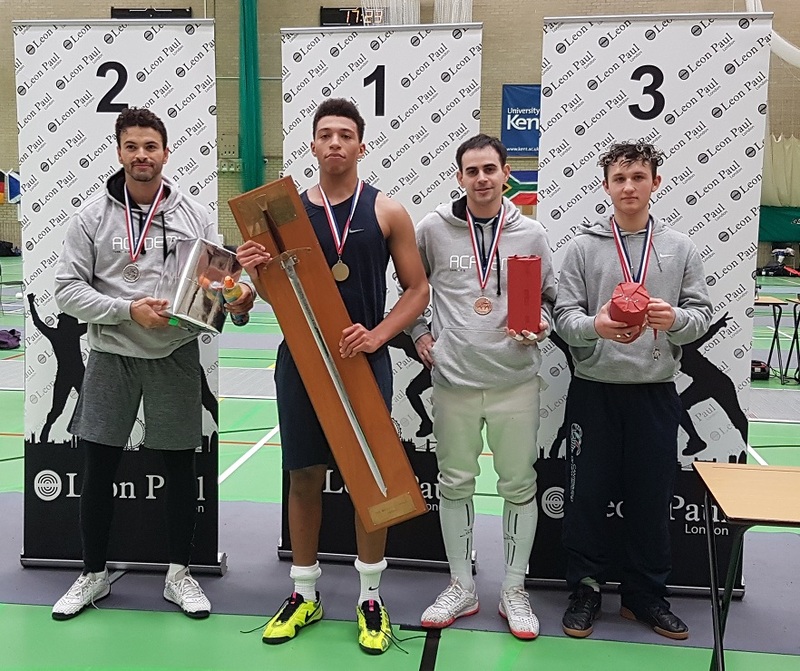 “The results achieved by Newham Swords fencers this season means that the Club has won all the major national titles at U17, U20 and U23 level, as well as produced fencers who have represented GB at U17, U20 and Senior World Cups. 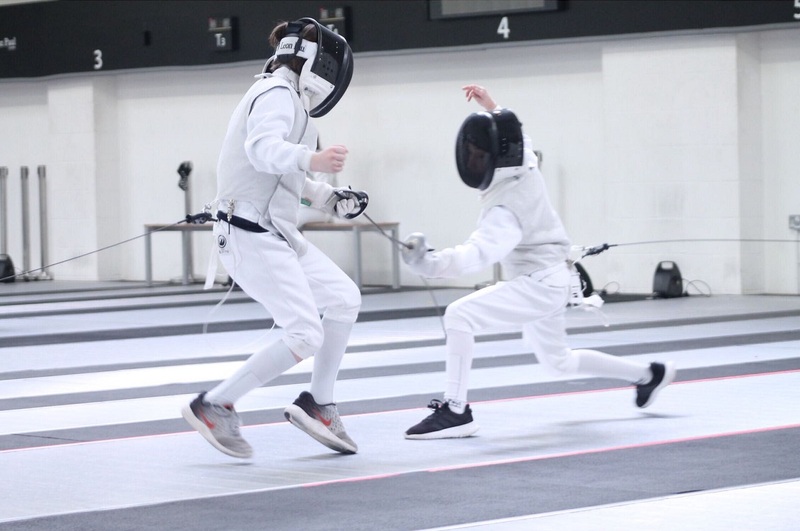 We have produced fencers who have represented England and GB (and won titles) at all the major championships including the UK School Games, the Cadet and Junior Commonwealths, the Cadet and Junior Europeans and Worlds, the World Student Games and the Senior Europeans and Worlds. No other fencing club has achieved this. Congratulations to Teagan Williams-Stewart for winning the annual Sue Wojciechowska nee Wrigglesworth Award. This is given to the most improved UK woman foilist. Sue was the youngest woman GB foilist to compete in an Olympics (Munich) at the age of just 17. Sadly she passed away at an early age. The award was presented by Ziemek Wojciechowski in her memory. 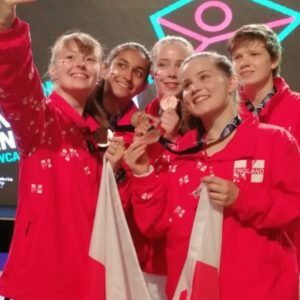 This rounds off a year in which Teagan has won 2 Gold, 2 silver and a Bronze medal and being the youngest fencer to reach the top 8 of the Senior Women’s National foil competition by coming 6th and other notable achievements. Congratulations also to Pierre Harper and Linda Strachan for their achievement in developing Teagan. 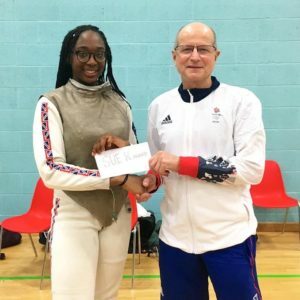 Teagan is the second Newham Swords fencer to achieve this recognition following Alice Campbell in 2016 who continues to progress her fencing career with notable wins this year. GB U20 International, Alice Campbell, ended her season in great style after taking a bronze medal for England in the Women’s Foil Team Event, at the Junior Commonwealth Championships. “Alice has had a terrific season where she has not only achieved double gold at the UK School Games at the beginning of the season, but has also gained selection for GB for the Junior European and Junior World Championships, as well as selection for England for the Junior Commonwealths. To achieve all of this in one season is amazing”, said Head Coach, Pierre Harper. Well done Alice!! Newham Swords are very proud of you!! More International Call Ups For Newham Swords! Following her selection for the Junior European Championships, which take place in Russia later this month, Alice Campbell has now been selected to represent GB at the Junior World Championships, taking place in Verona, Italy, in April, and England at the Junior Commonwealth Games which will take place in Newcastle in June. “Alice has had a terrific season so far. To qualify for the Junior European Championships, Junior Worlds and Junior Commonwealth Games all in one season, is an outstanding achievement”, said Club Manager, Linda Strachan. Well done Alice! England and GB Call Ups for Newham’s Super Seven!! 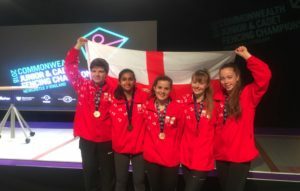 Newham Swords Fencing Club are very proud to announce that seven of its fencers have recently been selected to fence for England and GB at various Cadet, Junior and Senior World Cups taking place over the next two months. At senior level, Kamal Minott (GB No.4) has just been selected for the Senior World Cups in Cairo and Tokyo, whilst Junior Commonwealth Gold Medallist, Katrina Feklistova, has been selected to represent England at the 5-Nations Tournament, taking place in Cardiff. 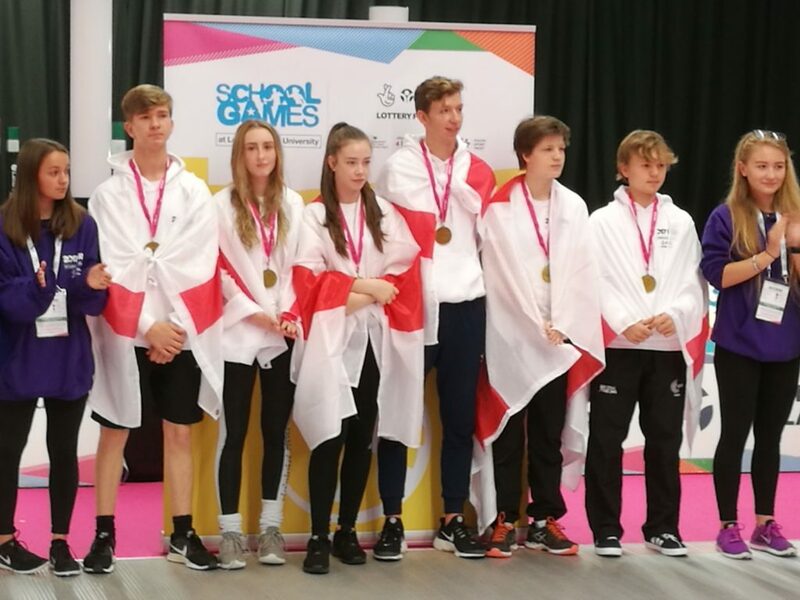 At junior level, recently crowned UK School Games Double Gold Medallist and GB No.2, Alice Campbell, has been selected for the U20 World Cup in Bochum, Germany, whilst Junior Commonwealth Games Gold Medallist, Ciaran Archer, will represent GB in Leszno, Poland. At cadet level, British U16 and England U15 Champion, Teagan Williams-Stewart, will represent GB at the forthcoming U17 World Cup taking place in Modling, Austria. She will be joined by British U16 Silver Medallist, Benjamin Udrzal, and team-mate Georgia Silk. Newham Swords are proud to announce that Head Coach, Pierre Harper, will accompany Kamal Minott to next month’s Senior European Championships. 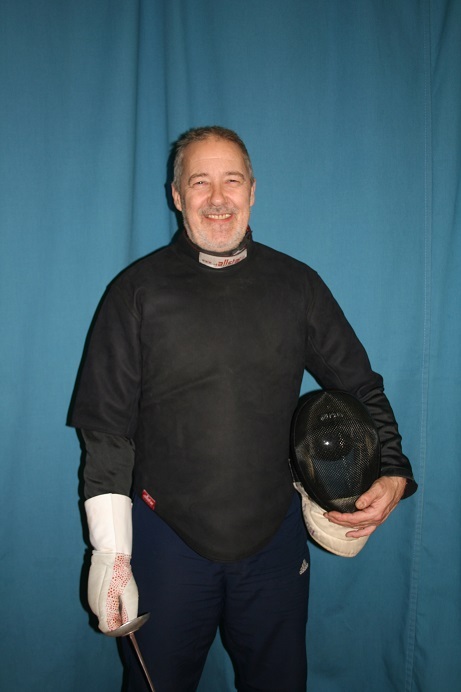 Pierre has previously worked with the GB Cadet and Junior Foil Squads, and helped them take a team silver at the 2010 Cadet Europeans, a team bronze at the 2014 Junior Europeans and a team bronze at the 2017 Junior World Championships. 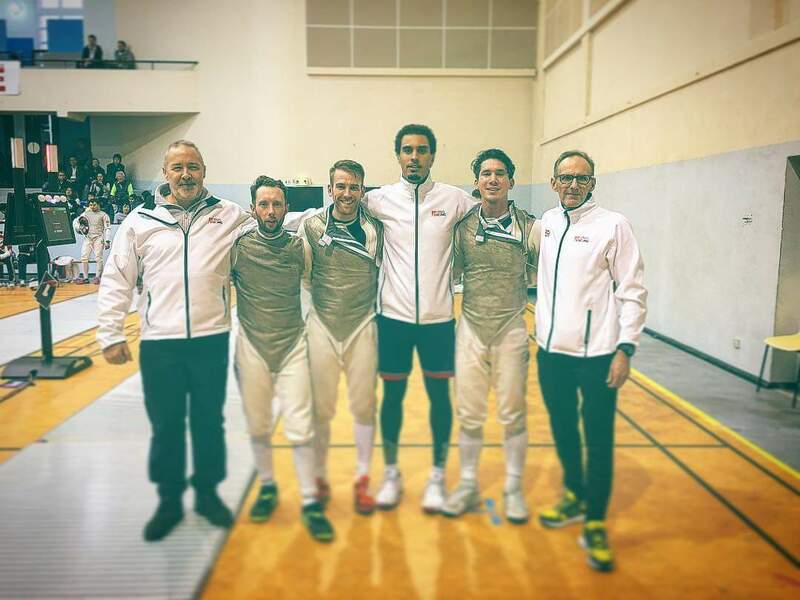 He will now get the chance to work with the GB Senior Men’s Foil Team made up of Olympians, Richard Kruse, James Davies, Marcus Mepstead and Newham Swords fencer, Kamal Minott. “I am really looking forward to working with these guys, all of whom I have known for a very long time”, said Pierre. 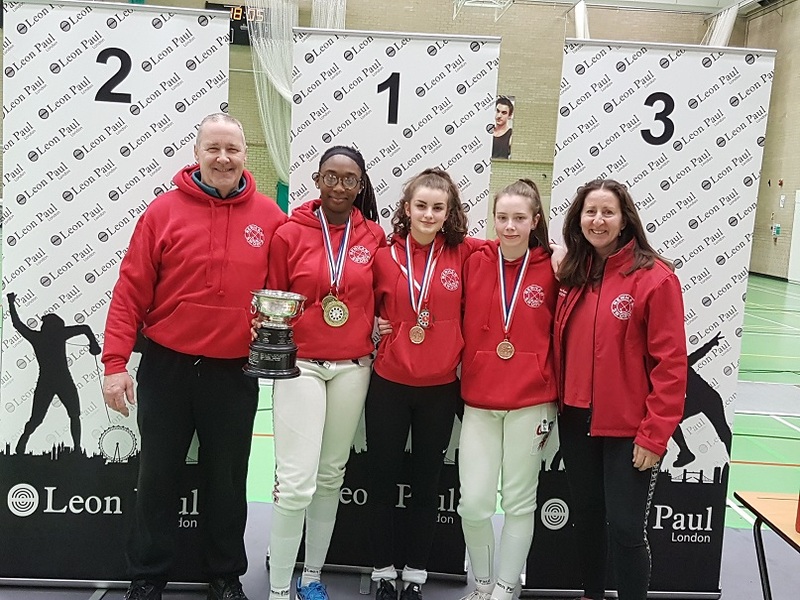 Last weekend, Newham Swords coach Linda Strachan participated in the Youth Sport Trust’s Girls Active Camp which took place at Loughborough University and during which many girls took part in a range of sporting activities, including fencing. At Loughborough University, at the "Girls Active Camp", delivering Fencing to girls from schools all over the country. So rewarding!! Good feedback so far! This video proves that sport really does bring young girls so much more than just keeping fit!